Grand Central Life & Style, 9781455538430, 304pp. The popular judge of Chopped and chef/founder of Beauty & Essex, Stanton Social, and Vandal opens up his kitchen with unforgettable food to share with your friends and family. Why serve boring food . . . ever?! 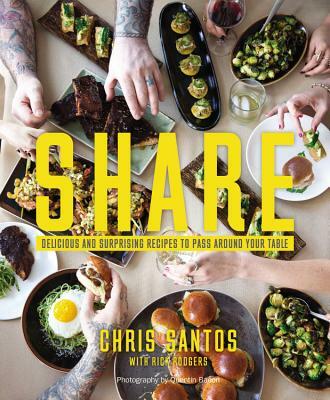 In Share, Chris Santos serves up the unique communal dining he has made his signature in his renowned Lower East Side restaurants. Here, he offers over 100 extraordinary "big platter" recipes for his creative take on old-school favorites, specifically made for family-style dining, as well as small plates that are fun to serve when entertaining. If you want to feel like you are hosting a real "downtown" party, you won't go wrong with Santos' legendary cocktails like Beauty Elixir, Emerald Gimlet, or the Woodsman, all of which go down well with starters like Nori-Spiced Tuna Poke Crisps, Crab Corn Dogs with Old Bay Aioli, or his famous Grilled Cheese Dumplings in Tomato Soup. You can follow up with exciting main courses like Spicy Lamb Souvlaki with Tzatziki or Korean Short Rib Tacos with Classic Kimchi. You'll have a hard time convincing your guests to leave if you serve them such desserts as Peanut Butter and Jelly "Twinkies" or Black-Bottomed Butterscotch Pots de Crème. These addictive dishes will have everyone at the table reaching for seconds. Share is comfort food at its highest level. And, you don't need a guest list or a party to try these surprisingly tasty recipes any night of the week! Chris Santos introduced the world to his unique brand of communal dining in 2005 with his debut restaurant, the Stanton Social. In 2010 he opened Beauty & Essex on the Lower East Side, which was named Open Table's Hottest Restaurant in America in both 2012 and 2013, and in 2016 he opened the 22,000 square foot, Vandal. He has been a judge on CHOPPED since its debut and has appeared as a guest chef on NBC's TODAY SHOW, CBS's EARLY SHOW, and the RACHEL RAY SHOW. Santos has served as a repeat guest chef at the White House and Camp David, and has been a brand ambassador for Jagermeister and Morningstar Farms.